SiteBuilder provides you with all the basics you could need within an interface that’s very easy to use. That’s why it’s an idea website builder for novices or learners. With over 1,000 website templates to choose from at SiteBuilder, you’re sure to find something that meets your business needs. There’s also a great image library that will enable you to further customize your site with rich media. You can do all of this without spending a dime, as the free version of the website builder gives you access to all of these great web templates and images. A blog can also be integrated at the touch of a button as another free feature of SiteBuilder’s website building services. Mobile-optimized sites are available but you have to upgrade your site to get this. However, once you have, you’ll be able to view your site as a mobile one, adapting the design to suit. All of these features and add-ons are very easy to manage with the site drag-and-drop interface that’s very self-explanatory. However, if everything is a bit too much for you, you can speak to the designers at SiteBuilder who will build a site for you, but this might come at an additional cost. Google Maps and social media buttons are free for all users and are easily integrated using the links on the left-hand side of the interface. You have the freedom to move these wherever you want on the site, which gives you great flexibility with your design. You do have to upgrade to the Premium or Ecommerce Plans to get search engine optimization (SEO) tools. However, you can alter your site meta tags, site header and footer HTML through the free plan, which is a huge bonus. Analytics are also an upgrade-only feature, but are worth investing in if you want to drive plenty of business to your site. If you’re an online store or you want to sell a few products online, you will need to upgrade to the Ecommerce plan, because no shopping features are available on the other plans. A free custom domain is available to you if you upgrade your website building plan with SiteBuilder. If you’re using the free version, you’ll be able to choose a domain but it will have “.myfreesites.net” fixed on the end. However, this won’t be an issue if you’re just using the site as a portfolio, blog or basic site for your business. Storage is a bit limited with all of the plans, and the free plan only comes with 50MB. This goes up to 10GB when you upgrade to the Premium or Ecommerce Plans. However, as SiteBuilder say themselves, unless you’re going to be uploading a lot of high-resolution images or large files to your site, this won’t be an issue. 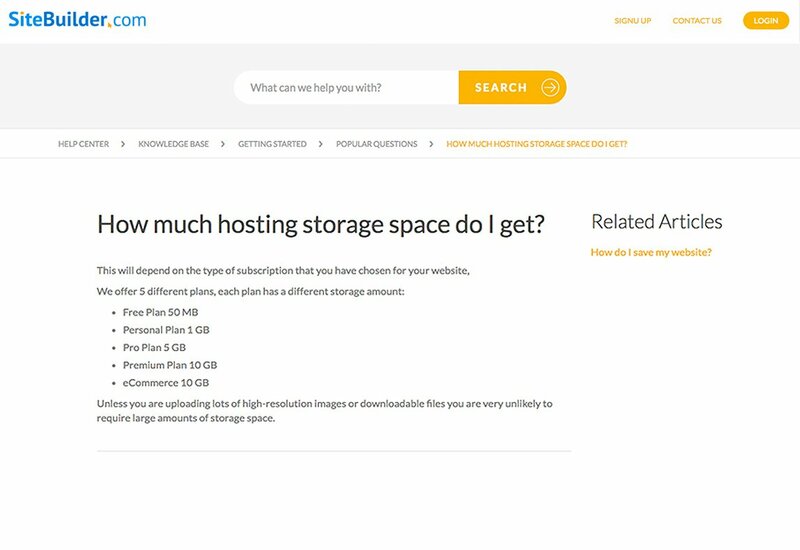 Nevertheless, for larger Ecommerce stores or photographers, for example, this may be something you need to watch out for as a lot of other web builders will provide unlimited storage. You’ll also get a free email address when you sign up for the paid plans, with each additional email priced at $5 a month. When you first go onto SiteBuilder, you can start building your website for free by just entering your email address. However, when you start looking to see how much upgrades cost it isn’t made very clear. Before you can see the pricing, you have to choose your custom domain, which is free with all of their plans. This can be a little disconcerting when you don’t know what prices you’re going to be faced with. Once getting through this, the plans are visible, but are presented with over 5 pop-ups before the plans can be viewed in full. A little bit too much up-selling for most. Once you have waded through all of these promotional pop-ups, you will find that the pricing is very reasonable. They do regularly run promotions, such as 70% off several of the website building plans for a limited time, which lowers one plan’s price down to $2.30 a month. Normal prices are as low as $7.68 a month with the Ecommerce being $18.45. $375 worth of advertising was also offered for free, which is a huge help when you’re trying to launch your site or online business. There’s an extensive customer support section on SiteBuilder. This features the answers to a number of questions that you may have as you start building and maintaining your site. If you can’t find the answers you’re looking for, you can email the team, chat with a representative live or call them with your questions. This service is available 24/7 with telephone support for those in the U.S./Canada, U.K. or Australia. But, it’s worth noting that much of the customer support team are not native English speakers, so they have some trouble understanding questions given to them. This might pose to be a problem if you run into some major issues with your site that you can’t fix on your own. SiteBuilder might not come with all of the additional frills that other website builders do, but what it offers is something that’s simple and easy to use. That’s why it’s a recommended site builder for individuals or small businesses who want to get their site live with minimal fuss or hassle. What’s more, the templates and features that are offered are well made, so you can really make your site look sleek and professional.